Happy Memorial Day weekend! I hope everyone enjoys their weekend. Back at home, we took a walk in a local park with my hubby and brother. We saw some awesome birds! The American Bittern was one of the first birds we saw on the trail at North Point State Park in Baltimore County, Maryland. One of the many Tree Swallows. Double-crested Cormorants on the Chesapeake Bay. How many snakes do you see? It is a warm sunny day so all the snakes, frogs and turtles were out enjoying the sunshine. 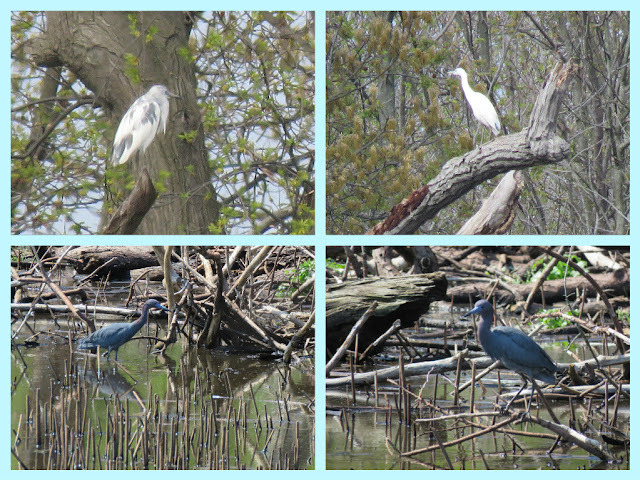 Below we saw the various stages of the Little Blue Heron, the all white juvenile, the mottled juvenile and the adult Little Blue. We saw a couple of Bald Eagles too. 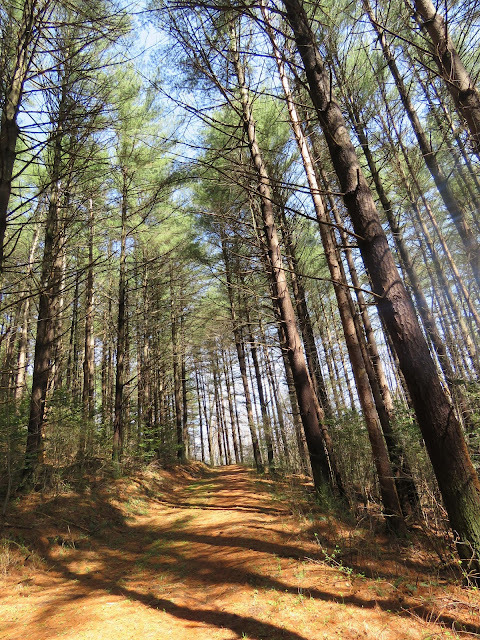 We enjoyed a walk on the Black Marsh Trail at the park, my brother joined us and probably took a thousand photos. I enjoy you all enjoy my birds and critter photos. Gorgeous photos! I love the Little Blue Heron! What a great selection of critters you have today Eileen. I hope you have a wonderful weekend and many thanks for hossting. You get the BEST photos! Okay . . . FIVE snakes? Nice post. Thanks for all pics. Great shots Eileen. The one of the osprey with the fish is fantastic! Love to see the little blue heron and the turtles as we don´t have anything like them. Your Great blue heron looks pretty much as our Grey Heron. It will be HOT over here :( Don´t like that anymore. One Little Blue Heron and the Bald Eagle, I will leave the snakes for another reader to admire. Congratulations on the American Bittern - never an easy bird to see. Nice series of photos and collages. what a great selection of birds! The bittern especially. What a wonderful variety of life — turtles and frogs and so many birds. It’s lovely to see all that beautiful life. I hope you have a wonderful weekend. ...what a wet and wonderful selection of critters, have a nice weekend. I think I have only seen bitterns when I wasn't looking for them specifically, but they are a treat! This time of year our Bald eagles, especially the younger ones, are flying north from south Florida along the coast, seeking cooler water where the fish will be closer to the surface. Many get up as far as Chesapeake Bay (one was tracked into Maine and even wandered into Canada!). They will return around November and December when our lakes cool down a bit. The adults tend to linger locally all summer, probably to keep an eye on their nesting and foraging territories. Great post ! What a lovely variety of birds and critters! Great capture of the Bittern and the Osprey with the fish! Amazing picture! Like your turtles shot and the Bald Eagle! Wow! So many snakes on the tree...it makes me shiver!! Many likes . . .
Snakes . . . four or five . . . not sure if they fall into my ‘like’ category . . . Always great pictures Eileen . . . I love that Bittern! We haven't seen one in awhile...hard to spot! Those snakes give me the creeps! lol Enjoy your weekend. I think we have one more good day before rain. I'm trying to decide where to go! Hugs! Fantastic shots, Eileen. Have a great weekend and a good week. Good Morning, dear Eileen. Beautiful photos from your visit. The osprey with the fish is amazing! Wishing you a very nice holiday weekend. Lovely critters and your photos do them justice, Eileen. I've never seen a bittern before -- and osprey! Wow! Beautiful things here today. A great assortment of photos, love all the birds, but it is the Bullfrog that really catches my eye! 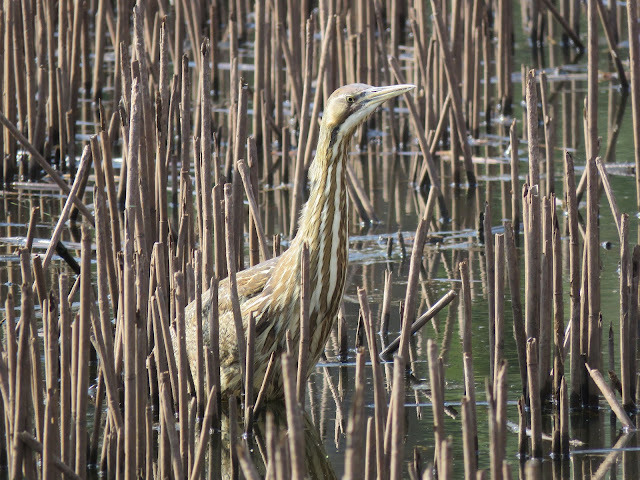 The american bittern is a master at camouflage and always hard to photograph. Awesome selection of critters ~ favorites are osprey w/fish, the turtles, bullfrog and the little blue heron! Obviously a great place for critters. Nice shots! I must say I'm partial to the little blue heron. Would love to see one of those in front of my camera. Happy Saturday! Beautiful captures of interesting critters! I like the one with the turtles sunbathing! Have a wonderful weekend! Eileen, great capture of the American Bittern. Thanks for sharing. All the other photos are great too. Great variety this week. Love the camo Bittern. Happy Day. Postagem muito interessante! Amo a natureza e suas curiosidades. Tenha um fim de semana feliz e abençoado. Abraços da amiga Lourdes Duarte. Eileen - I don't think I've ever seen snakes sunning themselves quite so openly!!! Cool! And I love the osprey/fish shot! Thanks for hosting, and happy Memorial Day to you and yours! Good fun today Eileen. I loved the selection of birds today, especially the American Bittern and that Osprey. That's a mighty fish to eat! Thanks for the link up today. Have a lovely Memorial Day. I love the Bittern, standing amongst reeds, but, all of them are delightful Eileen. the capture of the osprey is magnificent, that was perfect timing!! i LOVE those little blue herons you are seeing...but nothing tops the bald eagle. that's a great snap!! have a wonderful weekend and many thanks for hosting!!! Wow!!! Beautiful series of pictures Congrats.. The Bullfrog is terrific, but also the osprey with a prey is something! Well done, Eileen! Thanks for sharing. Thanks for the party. I haven't been around for while. But I have a special critter to share today. We are going to be traveling soon so I plan to be taking lots of pics. And joining you again. What an amazing day of birding you had! That is one big frog! That is an amazing array of critters! Well done! Have a great weekend! Our long one was last weekend! Wow! So many wonderful birds in one post! I love the pictures. Such wonderful photos! I’m particularly fond of the blue heron, the bullfrog, and the turtles. Just amazing! Wow, very nice. The first photo is spectacular ! A super selection of wildlife. Any sighting of a Bittern is a joy for me... so glad you got that photo. I trust you won't mind me joining in again after such a long absence from blogging. Great collection of critters photos today. Love the osprey with the fish, the turtles on the log and the frog. Excellent shots! The osprey with fish is awesome and I love the eagle. Wow! You got awesome photos on birds and other species... the bullfrog looks great, and interesting view on sunbathing snakes haha. All these critters make our weekend beautiful and cheerful. What fabulous photos of fabulous wildlife. Thanks and have a great weekend. Hope you have a fun holiday weekend! We have no special plans beyond a meal together last night. Awesome birds, I love the Little Blue Heron in all his stages, great job! I will continue to blog on blogger as well as facebook. I sent you a fb friend request. That is an awe-inspiring walk Eileen!! I have never seen a bullfrog in the wild! Hear them all the time, but can never locate them. Wonderful birds (and I even liked seeing all the snakes!) Thanks so much for hosting!! You shared some fantastic photos of GREAT BIRDS!! Thanks for sharing with us at I'd Rather B Birdin'. Have a safe holiday weekend. 4 snakes is all I see, YIKES what a chill up my spine sometimes they can do to me. What a super selection of birds here Eileen, loved seeing them all. I also enjoyed the slider turtles and the bullfrog. So many different critters. If I had to pick a favorite, it would be the turtle line-up. That's just adorable. Thanks everyone for the nice comments. Have a happy day! Tree swallow was it? I think, a very lovely critter, as they all are. They live in a life of awe, each enjoying the day of splendor as much as us! Absolutely amazing pics! wow! the first one is my favourite!